Everyone loves food and everyone loves trying out new places to eat. Maybe it’s a Friday or Saturday night and you and your friends are trying to find a place to eat for dinner. Maybe its a Sunday morning and you’re trying to find a place to eat brunch. Maybe you’re a senior, about to go out for lunch on a Tuesday or Friday and you’re wanting to get something quick and easy. As we know, Nashville is a huge tourist spot, especially for restaurants and shops. Being featured on dozens of episodes of TV shows on Food Network, Nashville has dozens of restaurants that newcomers, and even local residents, need to visit sometime in their life. Since there are so many featured restaurants here, we’ll only be looking at a few. The Loveless Cafe – Being a major pinpoint in Nashville, The Loveless Cafe is one of the more popular restaurants here. Doubling as a cafe and a motel, this Highway 100 restaurant is usually packed with hungry customers who are in love with the Loveless’ biscuits. Almost exactly 6 years ago, the beloved “Biscuit Lady” passed away, but the biscuits are still being made daily with the same recipe. Hattie B’s Hot Chicken – One thing Nashville is famously known for is its hot chicken. Hattie B’s (which has two locations in Nashville: on Charlotte Avenue and on 19th Avenue South) is a very popular spot to have a taste of the famous Nashville hot chicken. Since both restaurants are so popular, there’s always a huge line, so hope you don’t mind waiting! Las Paletas popsicles – Although it’s technically not quite a “restaurant”, Las Paletas on 12th Ave. S. bring in hungry customers who like to cool down on a hot day. This little shop in downtown Nashville sells a plethora picking of paletas (try saying that 10 times fast) with a twist. First off, a paleta is a popular Mexican sweet treat, or what we simply know as a popsicle. At Las Paletas, two women handmake dozens of different flavors of these popsicles: flavors range from as simple as a nice, sweet fruit or a vegetable to insane flavors like chili and chocolate, hibiscus, and avocado. 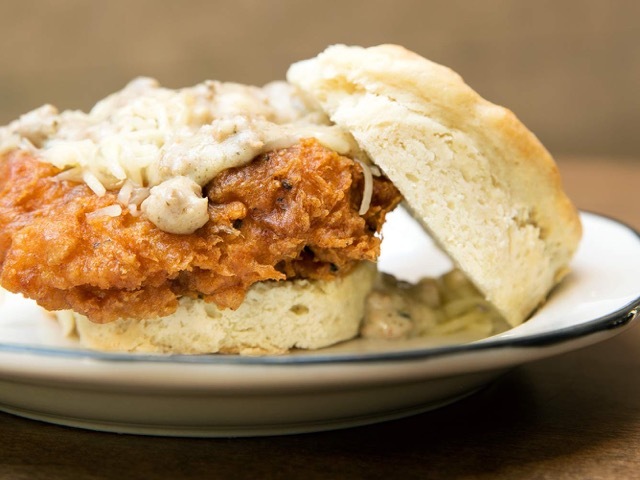 Biscuit Love – The south is widely known for its biscuits and gravy. Biscuit Love, also found in downtown close to the Country Music Hall of Fame in “The Gulch”, is a great place to eat breakfast or brunch if you love homemade biscuits, gravy, and chicken. The Grilled Cheeserie / Tom+Chee – Since both The Grilled Cheeserie and Tom+Chee are mainly about their grilled cheese, it’s only fair to put them in the same ranking. The Grilled Cheeserie is a Nashville based food truck that travels around Nashville (usually around downtown and the Centennial Park area) and gives hungry customers an amazing grilled cheese for the road and where you can even make your own grilled cheese. Tom+Chee takes it to a whole new level. The newly built restaurant has brought in many customers since opening day. At this restaurant found in the Nashville West shopping area, Tom+Chee makes all different kinds of grilled cheese. They have items from the regular grilled cheese that you know and love, to grilled cheese with baked mac and cheese on it, to grilled cheese with potato chips on it, and even grilled cheese desserts that use donuts as the bread! Many people have said that they actually find the donut grilled cheese to be somewhat delicious and is actually a popular choice on the menu. Speaking of donut grilled cheeses, would you try one? How about thirteen in one sitting? That’s right: T+C has a brand new challenge out where you have to eat 13 grilled cheese donuts in one sitting… one drink, no help, and no bathroom breaks. Go out and explore Nashville sometime: you may find your new favorite restaurant to eat at!